Bighorn has been featured as one of World’s most breathtaking ski suites in the Elite Traveler magazine. This luxury magazine is a global luxury lifestyle guide to the best hotels, restaurants, travel, fashion, watches, jewellery, jets, yachts and motoring in the World. Since its launch in 2001, Elite Traveler has been a market-leading guide and curator of the global luxury lifestyle of ultra-high-net-worth (UHNW) individuals. delivering expert perspectives, meaningful analysis and advice. Bighorn was included in this month’s Telegraph feature ‘Ski Holidays to Book Now’. The definitive guide to the best holidays available this winter whatever your style or budget, Bighorn was recommended as the best for ‘Out and Out Luxury’: “Nothing says luxury quite like being whisked into the wilderness from your own helipad and returning to a five-star chalet to enjoy a private spa, cinema and gourmet food”. Read the complete 2015 guide here. Our Executive Chef Peter Hughes has been busy sourcing some wonderful ingredients and designing new menus for this winter at Bighorn. With an emphasis on local provenance, Peter has even foraged chanterelle mushrooms from the grounds! He will also be using BC seafood (including smoked sablefish, Qualicum Bay scallops and Pacific halibut), Okanagan cherries, Boulder Mountain huckleberries and organic Penticton chicken. Our menus are designed to delight the tastebuds but also fuel a day’s epic heliskiing in epic mountains around Revelstoke. Peter works hard to create healthy, balanced meals with a touch of luxury and maximum taste. After all, every night is a celebration when you have been skiing perfect powder all day long! Renowned ski journalist Gabriella Le Breton shares her top picks for what is new and exciting on the slopes this season in a recent article for CampdenFB. Heliskiing at Bighorn is featured because it offers “unparalleled luxury”. The lodge has a private helipad which allows for a bespoke heliski package, either flying into the Selkirk Mountains for a heliski adventure or enjoying the exciting terrain at nearby Revelstoke Mountain Resort. The “palatial guest suites, a triple height great room with sweeping mountain views, celebrated chef, private cinema, outdoor hot tub and extensive spa” set Bighorn apart from any other lodge in North America. CamdenFB focuses on family business so Bighorn, which was developed by brothers Michael and Chris Kirkland, is particularly relevant for readers. Read the full article on heliskiing at Bighorn here. We all know breakfast is the most important meal of the day, never more so than if you are fueling for a day skiing Revelstoke’s epic powder. At Bighorn a sumptuous breakfast buffet is laid out each morning, with hot items cooked to order. As part of this feast, the executive chef Peter Hughes has created the ultimate muesli to energise skiers through until lunch. Healthy, nutritious and full of goodness, we serve it each day topped with really good yoghurt and fruit compote that we make with fresh berries and a reduction of crème de cassis. 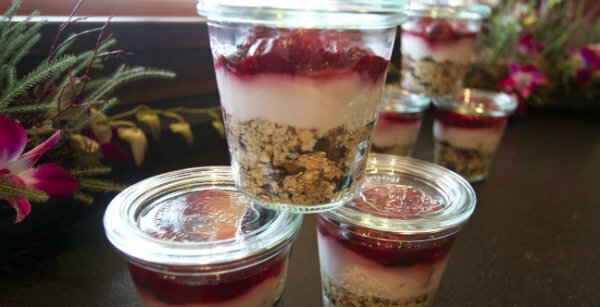 The following recipe will keep in an airtight container for up to four months so you can batch prepare and have a tasty, healthy, energy packed, low GI breakfast for the season. Use the best quality ingredients you can find and if possible use organic dried fruits and seeds. The recipe will transform very easily into Bircher Muesli by the addition of grated apple, yoghurt and honey and soaking overnight so that the dry fruit softens and become plump and juicy. 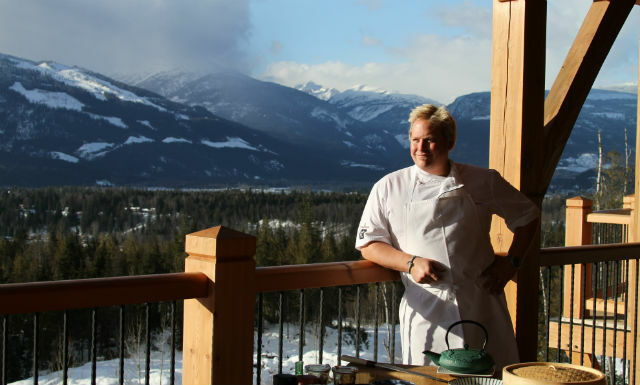 Let Bighorn’s Executive Chef Peter Hughes take the pain out of cooking the perfect Christmas turkey. Discover how Christmas dinner is delivered at the world’s most exclusive ski chalet. “First and foremost you must buy an organic, fresh, hormone free, ‘happy’ free-range turkey. No exceptions. Turn on the oven and preheat it to 300F or 150C. If you are stuffing the bird be sure to do this just prior to cooking and cook for 12 minutes per pound, so for instance a 16 pound bird will take around 3 and a bit hours. If you decide to stuff the cavity add an extra 30 minutes or so to the cooking time. Here is where I might differ slightly from convention. Turn the bird onto it breasts and with both hands placed flat on top push down really firmly as if you are performing CPR until you hear some cracking of the smaller bones in the chest cavity. This will help the juices in the bones to baste the bird from the inside during cooking. Roast the bird ‘upside down’ for the first 2 hours on parchment paper to prevent any sticking and therefore preserving the precious skin that will later be crisped and browned before carving. After two hours or so dice some carrot, leek, celery and onions. Roughly tear some sage leaves, some bay leaves and a few sprigs of thyme and place in the roasting tray. Now flip your bird over, cover the whole turkey in good quality smoked streaky bacon and put back into the oven with the vegetables, having carefully removed the parchment paper. Be sure to baste regularly with the juices that will after a couple of hours start to form in the pan being sure to coat the vegetables too. This is going to be the basis for really good gravy. After 2 ½ hours turn your oven up to 450F or 230C, remove the bacon and carefully brown the skin whilst continuing to baste regularly. After 3 to 3 ½ hours depending on your oven check the turkey is just cooked through by inserting a sharp knife just into the thickest part of the dark leg meat. The juices should be running clear at this stage with no traces of bright red blood. Once you are satisfied it is cooked thoroughly keep the Turkey hot by wrapping in heavy-duty aluminium foil. Now for the gravy. Deglaze the roasting pan with half a bottle of good quality dry white wine and transfer the contents into a saucepan whilst straining out the roasted vegetables (keep these for making stock later) Up the heat and reduce this stock by half whilst straining off any unwanted fat from the surface. Add a good tablespoon of Dijon Mustard. Now we are going to get a little ‘cheffy’, so bear with me, it’s worth it. To thicken the sauce you are going to ‘mount’ the sauce with something called ‘Monter au beurre’ which is basically a stabilized butter that won’t split with the heat of the sauce and will give you professional, glossy, wonderful gravy. To do this simply heat two to three tablespoons of water whilst whisking in cubes of cold butter carefully and 1 Tablespoon of plain flour so you end up with an emulsification of butter, flour and water. Go ahead and ‘mount’ the sauce with this mix and stir occasionally whilst the potatoes roast, the vegetables steam and the turkey takes a well-earned rest! So there it is, turkey for another year, done”. Last week the definitive guide to the most exclusive and indulgent chalets in the world was launched. The Luxury Chalet Collection has named Bighorn as one of the top 20 properties in the world. The gourmet cuisine and stunning design, coupled with exceptional feedback from guests, were factors in selecting Bighorn to be part of the collection. With first class facilities such as a movie theatre, games room, indoor pool, giant outdoor hot tub, spa and cocktail bar, Bighorn truly is the ultimate ski pad. Offering dedicated service from a team including an award-winning chef and expert housekeeping staff, guests can relax in the lap of luxury. The private helipad at Bighorn really sets it apart from the competition, providing guests with a unique opportunity. 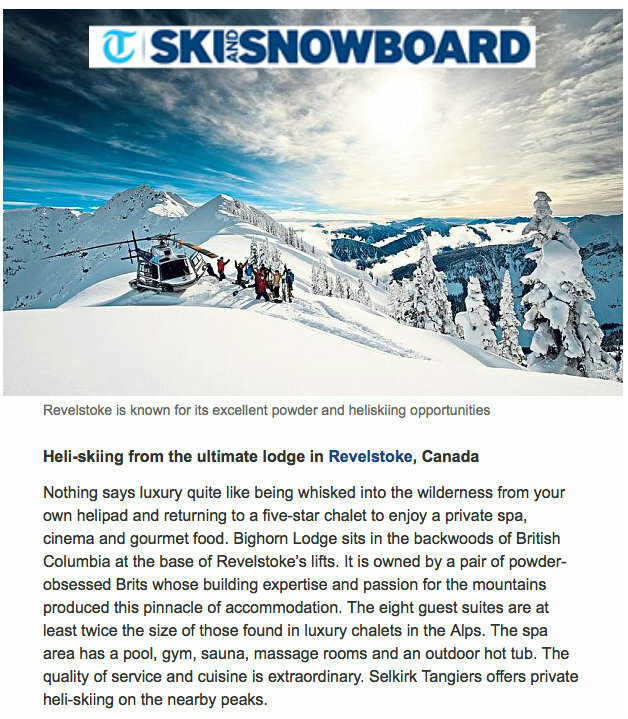 Offering both heliskiing and exciting resort skiing at Revelstoke Mountain Resort, guests have access to the best snow, terrain and scenery anywhere in the world. As the Revelstoke heli ski season draws to a close, we have been looking through the Bighorn guest book and selecting some highlights. Bluebird days heli skiing in the A star, the romantic couple that took a private heli for 2, fresh tracks down Greely Bowl and face shots in the trees on Paradiso. But at Bighorn the phenomenal skiing is enhanced by indulgent service and stunning accommodation. Chef Peter Hughes’ cuisine has been much talked about, from the “Japanese feast cooked up in front of our eyes” to the “incredible beef fillet – the singular best thing I have ever eaten”. 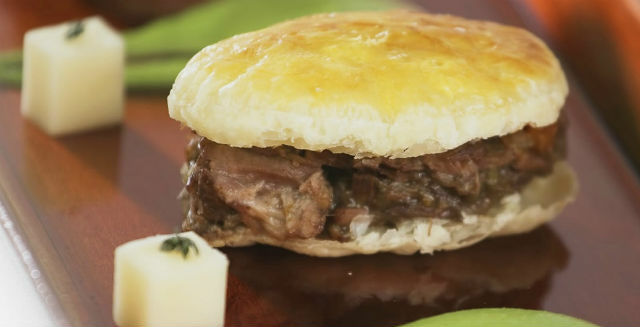 One of the most commented-upon treats were the delicious Mini Boeuf Bourguignon Pies: “the ultimate apres ski beer snack”. As part of our Notes From the Chef’s Table blog posts, we tell you the secret recipe to make them yourself – or book your trip to Bighorn to try them without the effort! In a large mixing bowl season the beef with flour, salt and pepper and set aside whilst you prep your vegetables. Finely chop all the vegetable ingredients and smoked bacon and sweat gently in a heavy bottomed saucepan until translucent. Remove from saucepan and keep in a bowl to add later. In the same saucepan as you cooked the vegetables add the seasoned beef and sear whilst stirring continuously to get some good colour on the meat (remember colour is flavour and will make a big difference to the final result). After ten minutes pour in the wine and marry all the remaining ingredients together in the saucepan. Bring to a simmer and stir every ten minutes for the first half an hour to avoid a sticky disappointment! Once the ‘gravy’ has started to thicken and the beef starts to become tender stirring occasionally (this dish is a labour of love and the more you care for it the more you will be rewarded in the finished article) turn the heat down further until a gentle simmer can be sustained in the pan for a further two-three hours depending on the size of your beef if you’ll pardon the expression! Towards the end add the small soaked cocktail onions and simmer for 30 minutes more. Total time simmering should be no more than 3 1/2 hours but if the boeuf still seems a little tough the simmer gently for longer. Meanwhile in a preheated fan assisted oven at 180c or 350f cook pre-cut oval or round mini discs of pre-rolled frozen puff pastry on parchment paper or baking sheet glazed with eggwash until golden in colour. Allow to cool slightly (these can be pre-made and will keep at room temperature for up to a week in airtight containers). Take a sharp serrated knife and cut the pastry shapes horizontally to create tops and bottoms. Spoon in some of the Bourguignon and top with a lid and serve with beer and smiles!